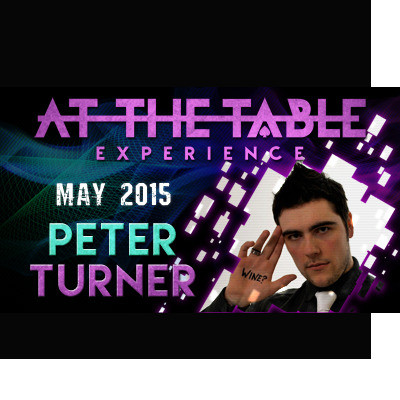 Peter Turner joins us for an unforgettable At the Table Experience! Peter is currently consulting on countless TV shows across the world, applying his highly sought after mentalist mind to some of the world's biggest stages. Peter is known for his bold approach to mentalism which has left nearly all of his material sold out within hours of release. From gritty street performances to completely baffling mind reading, we've got you covered! Don't miss out on one of the most promising lectures of the year! I can't wait for this. I saw Peter Turner at MindVention last October. He is the real deal. I don't know exactly what he is going to lecture on here, but I can tell you that he has every weapon you could want in your arsenal. He has card skills, he knows how to completely destroy the possibility of there even being a method, and he knows how to deliver impactful experiences to his audience... be they magician, mentalist, or layperson. I'm pretty sure there will be some clever methods taught here, but the real value for me is in seeing how Peter builds experiences. That is something which can be put to use in everything you do. $7.95 is a ridiculous bargain to be tapping into the mind of one of the most sought after and brilliant minds in magic and mentalism. I almost forgot about this with the change in scheduling for these lectures! I'm totally stoked to see Peter's work without having to shell out the hundreds of dollars which it typically can sell for. I've been interested in Peter's work since I first heard of him; but this is my first experience watching him perform & teach. There is solid gold in this lecture, you'll have to watch it several times to absorb everything. Incredible value. Thanks Vanishing Inc.!! This lecture is less about tricks, and more about subtleties. Peter does demonstrate a handful of tricks, mostly things like PIN code divination, star sign divination, and so on. But those are almost irrelevant, because he's really teaching how to frame questions and get the most out of a performance. He demonstrates the tricks to the live audience, but also shows clips of him performing in public. Good stuff if you're interested in mentalism. Great lecture! By watching the lecture you can really feel for his creativity. Peter is known for his presentation driven effects and all performers could get something out of this lecture. However, some would say he often goes off on tangents and taking a while to return to the topic at hand; however, this for me has been a bonus to understand how the effect came into being. Sometimes in lectures, it is structured as performance then explanation. But in this lecture you learn how the effect was created and refined. Also, the lecture is over 3 hours long and 7 dollars and 50 cents. Which is a bargain. This lecture will definitely supplement his other works.